A Linda Vista grandfather is missing a pricey, sentimental piece of jewelry after trying to help out some strangers. 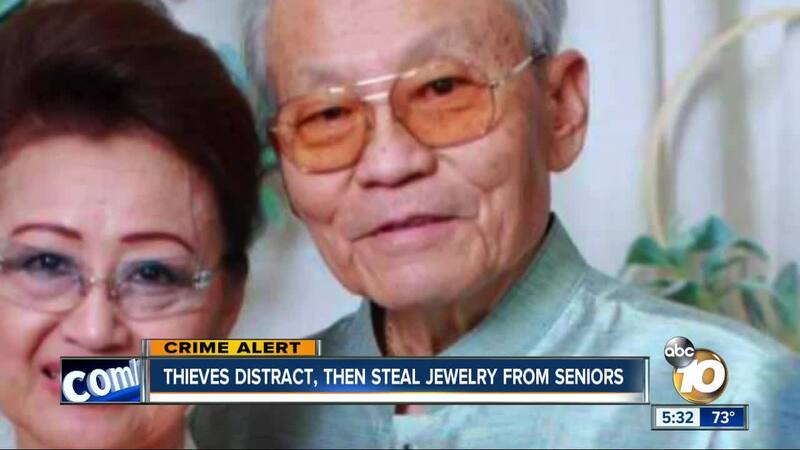 SAN DIEGO (KGTV) - A Linda Vista grandfather is missing a pricey, sentimental piece of jewelry after trying to help out some strangers. Steve Phakdy says his 71-year-old father was attending an event at a Buddhist temple in Chollas View more than a week ago, when a white Chevy Tahoe pulled up. "Flagging him down, saying, 'Hello mister.' The husband says, 'It's my wife's birthday. Can you give her a blessing?'" said Phakdy. Phakdy says his father did something to acknowledge the birthday. A woman in her 30s then got out of the SUV. "She hugs my dad," said Phakdy. In the backseat was a baby in a car seat. "The husband gets out and says, 'We have some jewelry to give you or show you,'" said Phakdy. Together, the two placed rings on his hands, wrapping necklaces around his neck and arms. "The husband was grabbing his wrist. Turning it around doing this and doing that," said Phakdy. His father offered to pay for the jewelry, but the couple quickly drove off. "Was looking at the bracelet they gave him and hey, wait, where's my bracelet?" said Phakdy. Gone was a 24-karat-gold-and-diamond bracelet, an anniversary gift from his wife. The diamonds on the bracelet spell out his last name: Phakdy. He's not the only victim. San Diego Police say they've received several similar reports in recent weeks of scams targeting elderly Asian victims. "I'm pissed. They're just going to continue moving from community to community. It's disgusting. They are preying on the elderly and the vulnerable," said Phakdy. Police say the suspects are possibly of Middle Eastern descent and have been casing Buddhist temples. If you have any information on the cases, you're urged to call San Diego Police at 619-531-2000.